Isaac Okoro has done a lot of winning through the years, and the consensus top-40 senior plans to do a lot more of it this winter. 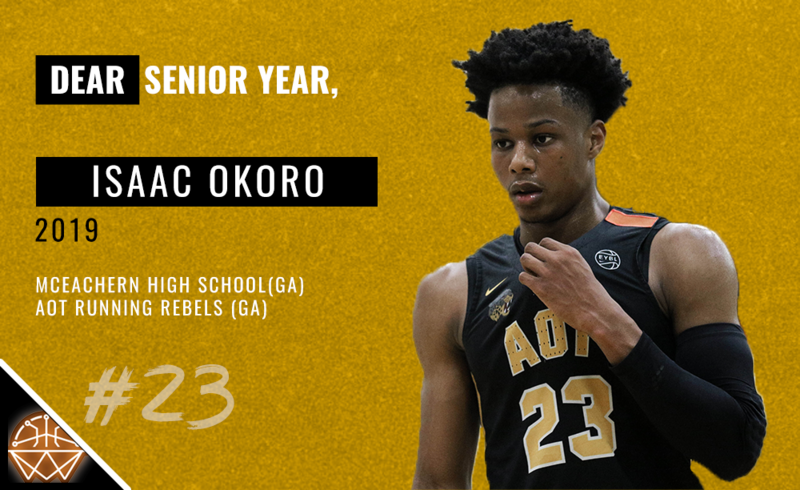 Okoro, who stars for McEachern high school during the prep season the AOT Running Rebels in the NIKE EYBL, is a month and a half away from kicking off a senior campaign that should be a memorable one. Okoro leads a McEachern group that has turned into a certified powerhouse, operating alongside junior teammate Sharife Cooper to make the Indians 'scary' good. Okoro put up major numbers for AOT at Nike's Peach Jam, averaging 17.8 points, 62.7 FG%, 11.2 rebounds, 5.0 assists and 3.5 steals in five contests. We caught up with the future Auburn Tiger, addressing a variety of topics before he takes on his senior year. Playing at McEachern has been great. We have a lot of great staff and coaches, and everyone has been appreciative of the fact that we've been so successful. It's just been a great experience and we've won a lot as a unit. Coming into my last season, I want to win a state championship, because that hasn't been done yet. Playing with (my teammates) is great. We are really close with one another, inside of school and outside of school, we're around each other a lot. We know what we are good at, and we don't do anything thats outside of our comfort zone. We're good at picking out spots. We've been playing together since third grade, so it’s kind of a brotherhood. I thought about making basketball my main priority in 8th grade - the 8th grade summer when I got my first offer, I was like 'okay, this was a sport I can be really good at, that I can take to the next level.' I always played basketball. I played football as well, but that's it. I basically just played football to get more physical on the basketball court. But I’ve played basketball my whole life. Sophomore year of the final four in high school, for sure. I feel like I should have been more aggressive and taken more leadership into that game. I feel we should have won that game. I feel like playing a national schedule and playing great teams is going to help us come back and be ready for the competition we face in Georgia. Winning a state championship is the main goal. (Auburn) is getting a versatile player who will stop at nothing to win. Off the court, they’re getting a hard worker. My parents and my coaches (have had a big influence on my life). My parents are always there for me, and coach Omar (Cooper) has been with me since we first started A.O.T.. He’s been training me for a long time. I would just thank them for helping me with my path throughout junior year. Anytime I needed help with anything, they were there. I just thank them for everything they did and continue to do for me.